I never in a million years would have thought l’d like to be the stay at home kind of girl. But with the little vegan bun so close to arriving (! ), I find myself ‘nesting’, with so many DIY projects on my list! Becoming domestic is always something I’ve wanted to explore more. Though its hard with the everyday work schedule. Now with just one week of work left, I have time to dive in. First on my list was making my own laundry detergent. Wait, let me be honest; first on my list, for years, has been to make my own dog food. And that will come in time, as my excuse of now is needing more storage space. So laundry detergent…. a totally simple-money saving task that would prove to be easy as pie to work into anyone’s lifestyle. I have had a couple friends that have been doing this for so long, with far busier schedules than me, so I knew I had no excuse. And along with the cloth diapers about to start rolling in daily, I knew this was the time. Method adapted from Wellness Mama! 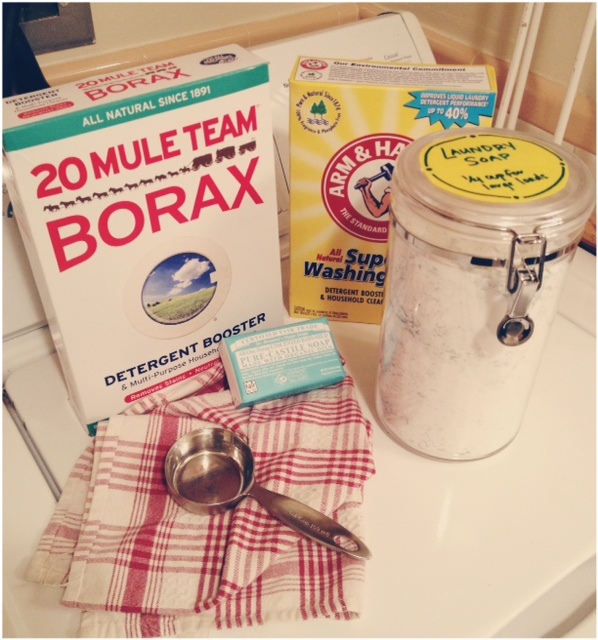 Borax – A natural laundry booster that lifts stains and odors from your clothes. You can find this at just about any grocery store. Washing Soda – A natural water softener and stain remover. Also found in the detergent aisle at many grocery stores. Bar Soap – I prefer to use an all natural, less perfume-y style soap. Dr. Bronners makes bar soaps, and if whole foods happens to have a sale going on- even better. Container – You will need something to store the detergent in, preferably something that has a large opening, so you can easily use your scoop. Cheese Grater – Your standard, handheld grater. 1/4 cup scoop – Any measuring cup will do! In a large bowl, using cheese grater, shred the bar soap. I use the medium sized teeth. Once you have finished, mix in 2 cups borax, and 2 cups washing soda. The proportions should be 1 cup bar soap, 2 cups borax, and 2 cups washing soda. Gently stir together till fully incorporated. Make sure you get to see little specs of your bar soap squiggles throughout the batch! Transfer to your storing container. And Voila! You just made Laundry Detergent! To use: 1/8 of a cup for smaller loads, and 1/4 cup for large loads. Our first trial run just happened to be the day Erik brought all of his soccer clothes home. And boy were they stinky! The detergent proved to work! I am still accessing my math on how mush this will save us, but I think it cuts the price in half (possibly more) of what we’d spend on liquid detergent. Not to mention we cut back on contributing more to the plastic take over of the world. This article was posted last week about plastic in our oceans, and the effects it has on whales, and various animals around the globe. This entry was posted in DIY, Natural Health and tagged borax, DIY, dr bronners, Laundry detergent, vegan, vegpod, washing soda.